Hello friends, today we are about “How to get lost Smartphone IMEI Number by Google”. Every Smartphone have an unique International Mobile Equipment Identity (IMEI). And when you lost your mobile or stolen, then IMEI Number make key roll to find it. At present time billion of users have to use different kind of smartphones. These smartphone will be windows, Android, iOS or any other type of phone. You know very well about the IMEI number. IMEI number provide an important role and without this number you will be frustrated when you lost your mobile or stolen, so always keep in mind or store your mobile phone IMEI number in any safe location. Most of the persons who are using his mobile phone i am dam sure they don’t know his mobile IMEI number. If you lost your phone or someone stolen your mobile phone first you have to immediately block your phone by filling FIR into the nearest police station and also inform to your telecom agency to quickly drop your phone number in the blacklist to prevent anyone else to use his phone. If anybody use your mobile phone his location will be traced with the help of IMEI number. IMEI number is a unique number which helps to identify your device within the different mobile network. First you have to know how could you know IMEI number of your mobile for this you have to dial *#06# by your phone dialer, it will displayed on your mobile phone screen. It’s very simply process to know your phone IMEI number, if you have to use any kind of smartphone which support dual sim in that case you have to get two IMEI number of each slot when you dial *#06# from your phone. You can also use another method to know IMEI number for this you have to open Settings option on your phone then choose About Phone option, click on the Status option and press then long the volume key your phone IMEI number automatically copied into the clipboard. But in that case you forget your phone IMEI number, or someone stolen or you lost your phone then there is no need to worry you will be able to recover the number from the Google Account. For this you have to open google.com/settings option then logged into the Google account by your registered email id then open the Android tab. 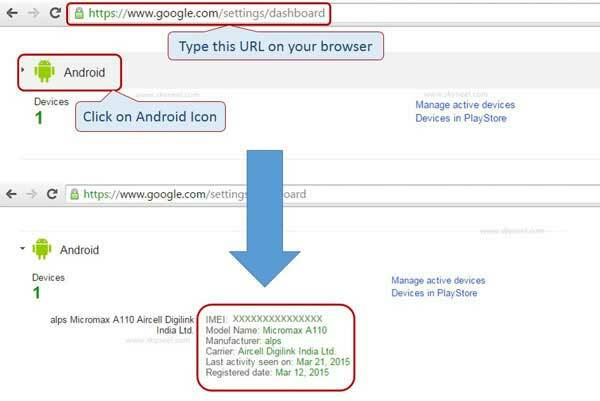 If you have more than one Android device then you will be able to see all connected Android devices which are connected to your Google Account and your will get the list of all mobile phone IMEI number. Step 1: Click on this Google account dashboard URL: https://www.google.com/settings/dashboard and Sign in with your Android phone associate Google Account. Step 2: Scroll down and find Android after then click on Android Icon. You will see your phone information with your IMEI no. Note:You can also watch IMEI number of your phone on the box or you can also get back from the invoice of mobile number is you keep safe. I hope you like this get lost Smartphone IMEI Number guide from which you will be able to easily get lost Smartphone IMEI Number without any extra efforts. If feel any problem in this guide then please use comment box. Thanks to all.